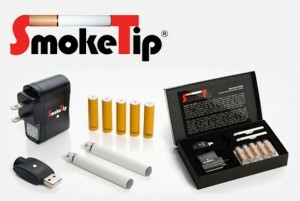 Unlike most electronic cigarette companies, Smoke Tip offers only one starter kit. The whole idea is simplicity and quality. They let the product speak for itself. The e-cigarette looks like most popular brands white in color and the cartridge matches the flavor in color as well. They do have accessories to expand on hardware and have a solid line of flavors. SmokeTip have survived and thrived because they just so happen to have one of the best electronic cigarettes on the market to this day and customers have kept coming back for the customer care. The simple kit gives you everything you need and you get batteries for life! When your battery dies, they send a free replacement with the purchase of a flavor cartridge pack, no headaches, great service. They also offer a disposable SmokeTip e-cig, and if you want to learn a little bit more about the product, read our full SmokeTip Electronic Cigarettes review here. The Smoke Tip Starter Kit provides 2 lithium batteries, 5 cartridges and both and wall and USB charger, just enough to get you going for a full day of vaping. Accessories from charging cases to more batteries can be added, but with SmokeTip’s lifetime battery replacement policy, if two is enough, you will never have to spend on batteries with SmokeTip again. The cartridges rate for 250 puffs and the 180mAh battery last for about that as well. With constant flavor cartridge deals and bulk purchase extras, even re-fills remain cheap with SmokeTip. A good choice all around if you are in the market for a basic but top shelf, satisfying e-cigarette. From extra batteries, battery chargers, car chargers, carrying case, cleaning kit, lanyard, and more, Smoke Tip offers low prices on all of their accessories so you can customize your starter kit the way you want. 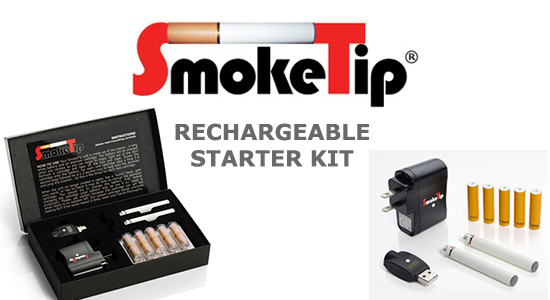 Many SmokeTip customers start with the disposables, then purchase the starter kit and later add the accessories that fit their particular needs. The prices for the accessories are certainly reasonable and they offer a wide selection to cater to all customers. With 22 great flavors and a more than reasonable pricing structure, you can purchase refill cartridges when you need them to fit your lifestyle. The cartridges themselves are very easy to use and incorporate the advance technology that has helped make SmokeTip one of the more popular companies around. With a respectable puff count of 250, we find they rate more like 200 but the flavor and vapor are balanced throughout. At the 200 mark, it dies down. With the flavor for the week you get a 5 Pack for just 8$ and multiple 10 pack purchases come with free gifts from batteries to full kits. As an alternative to purchasing the starter kit, you can instead choose a disposable e-cig that gets you about 500 puffs each or the equivalent of 50 traditional cigarettes. In this manner, you can purchase one to see if SmokeTip is right for you without having to go all-in on the starter kit. Plus, you can keep on purchasing disposable cigarettes for a price that will still save you money over buying traditional tobacco cigarettes. In addition, SmokeTip offers an electronic cigar as well that delivers a satisfying flavor without running the risk that tobacco provides. The electronic cigar is good for over 1000 puffs or about 12 standard cigars, making it a tremendous value compared to the real deal. Overall, Smoke Tip’s unique approach has helped set it apart from the competition by providing a singular choice in starter kits, but a myriad of choices to add to your purchase. By allowing customers to customize to their particular needs, Smoke Tip has gained a strong reputation within the e-cig community for its quality, advance technology and expanding choices.